You can disable the encryption of artifacts in a build. You might want to do this so that you can publish artifacts to a location that is configured to host a website. (You cannot publish encrypted artifacts.) This sample shows how you can use webhooks to trigger a build and publish its artifacts to an Amazon S3 bucket that is configured to be a website. Follow the instructions in Setting Up a Static Website to configure an Amazon S3 bucket to function like a website. Open the AWS CodeBuild console at https://console.aws.amazon.com/codesuite/codebuild/home. If a CodeBuild information page is displayed, choose Create project. Otherwise, on the navigation pane, expand Build, and then choose Build projects. On the Create build project page, in Project configuration, for Project name, enter a name for this build project. Build project names must be unique across each AWS account. You can also include an optional description of the build project to help other users understand what this project is used for. In Source, for Source provider, choose GitHub. Follow the instructions to connect (or reconnect) with GitHub, and then choose Authorize. 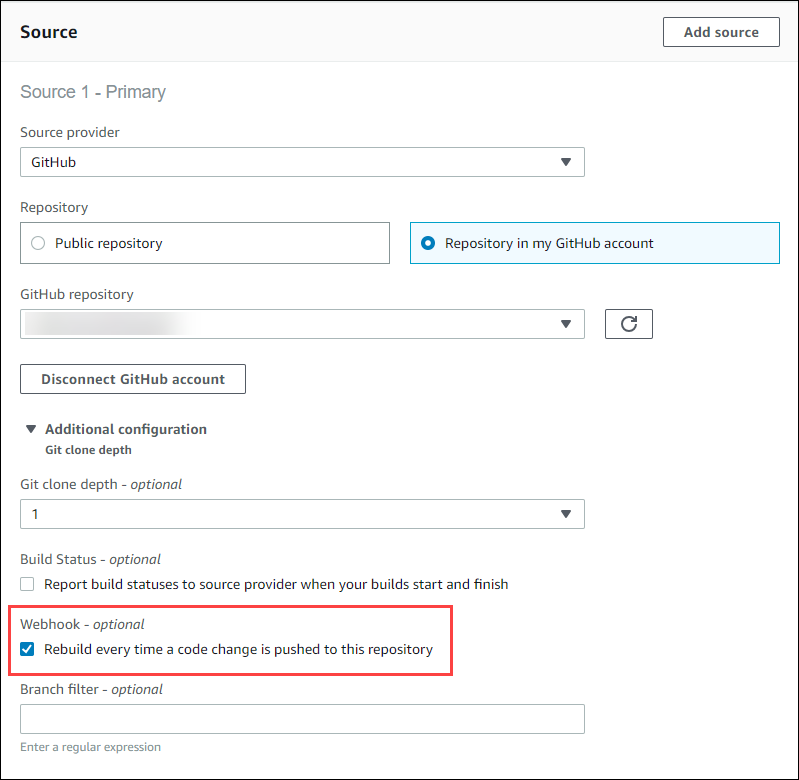 For Webhook, select Rebuild every time a code change is pushed to this repository. You can select this check box only if you chose Use a repository in my account. To use a Docker image managed by AWS CodeBuild, choose Managed image, and then make selections from Operating system, Runtime, and Runtime version. To use another Docker image, choose Custom image. For Environment type, choose Linux or Windows. For Custom image type, choose Amazon ECR or Other location. If you choose Other location, enter the name and tag of the Docker image in Docker Hub, using the format docker repository/docker image name. If you choose Amazon ECR, then use Amazon ECR repository and Amazon ECR image to choose the Docker image in your AWS account. To use private Docker image, choose Custom image. For Environment type, choose Linux or Windows. For Custom image type, choose Other location, and then enter the Amazon Resource Name (ARN) of the credentials for your private Docker image. The credentials must be created by AWS Secrets Manager. For more information, see What Is AWS Secrets Manager? If you do not have a CodeBuild service role, choose New service role. In Role name, accept the default name or enter your own. If you have a CodeBuild service role, choose Existing service role. In Role name, choose the service role. When you use the console to create or update a build project, you can create a CodeBuild service role at the same time. By default, the role works with that build project only. If you use the console to associate this service role with another build project, the role is updated to work with the other build project. A service role can work with up to 10 build projects. Choose Use a buildspec file to use the buildspec.yml file in the source code root directory. Choose Insert build commands to use the console to insert build commands. For more information, see the Build Spec Reference. In Artifacts, for Type, choose Amazon S3 to store the build output in an Amazon S3 bucket. For Bucket name, choose the name of the Amazon S3 bucket you configured to function as a website in step 1. If you chose Insert build commands in Environment, then for Output files, enter the locations of the files from the build that you want to put into the output bucket. If you have more than one location, use a comma to separate each location (for example, "appspec.yml, target/my-app.jar"). Expand Additional configuration and set options as appropriate. Choose Create build project. On the build project page, in Build history, choose Start build to run the build. (Optional) Follow the instructions in Example: Speed Up Your Website with Amazon CloudFront.